I get so much joy of cooking for the people I love, and I'm sure you can all relate to this feeling! It is especially enjoyable when I can cook something "new" for my partner, even if it is just something I've added onto the old favourite, like this one. 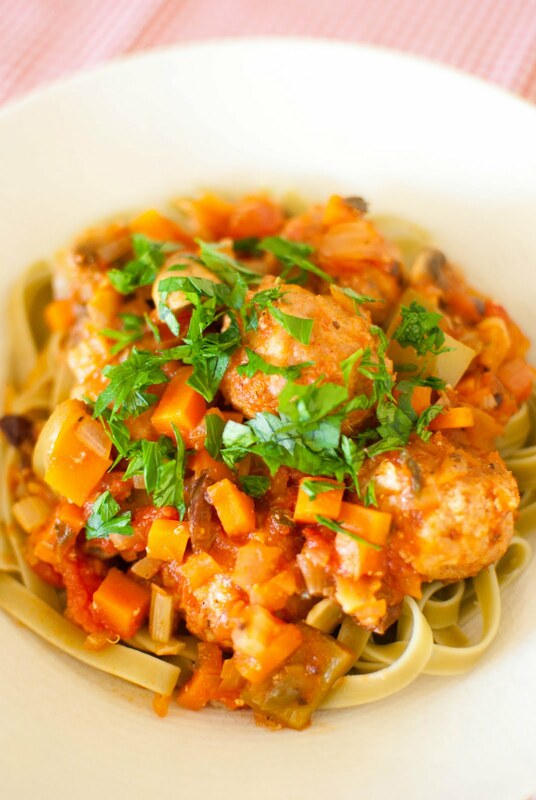 The vegetable medley I made for the meatballs adds so much to this dish. 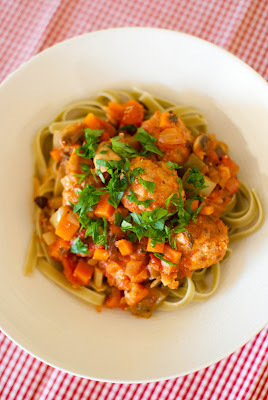 You could of course leave the meatballs out altogether and replace them with tofu or tempeh or just have the sauce on its own with some pasta. This is a colourful dish, perfect for brushing of the rainy day blues! Preheat oven to 200C. Line a baking tray with baking paper. In a large bowl mix together the mince, egg, soy sauce, rice crumbs, paprika and some ground black pepper, and combine everything really well. Using wetted hands, take out small portions of the mixture and roll into balls between your palms. Place the balls on the baking tray. Bake in hot oven for 20 minutes, rotating the tray half way through. For the medley, heat the olive oil in a large frying pan. Add the onion and sauté for a few minutes. Add the carrot and the celery and sauté for another couple of minutes. Add capsicum and mushrooms and stir them through as well. Pour in the tomatoes and the water and season with thyme, rosemary, sweet basil and black pepper. Leave to simmer for about 15 minutes, then add the capers, olives and the oregano and let simmer a further 10 minutes. Add in the cooked meatballs and heat for a few minutes. Serve with pasta and sprinkle with fresh parsley. I love cooking for my hubby too. The vegetable medley sounds really flavorful, especially with the addition of olives and capers! What a beautiful dish!! looks sooo comforting and warm! 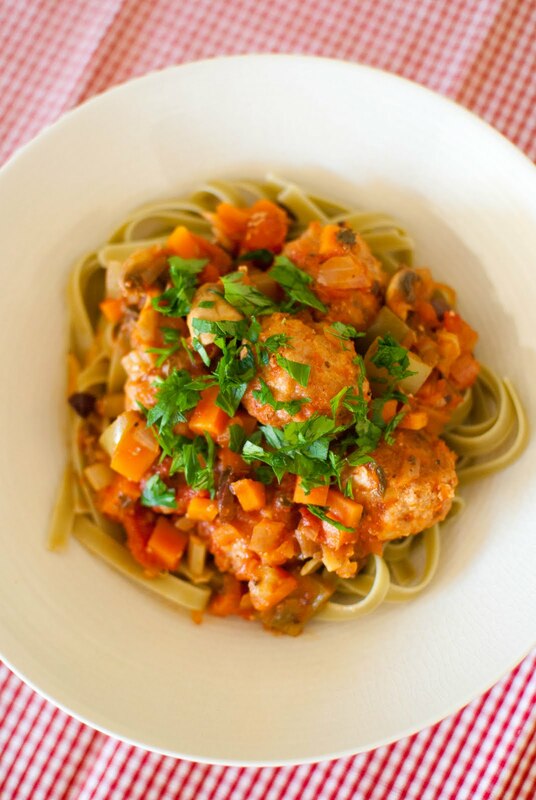 It's like a fabulous take on a ratatouille, with the added bonus of tasty meatballs! Hope your rainy day blues pass soon!